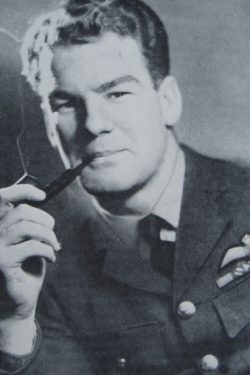 Al Deere was possibly the best known of all the New Zealand fighter pilots. 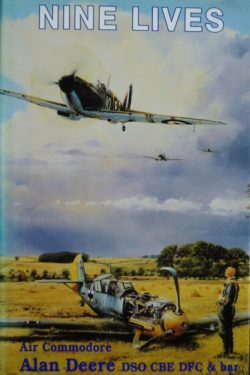 Flying Spitfires with 54 Squadron, during four days – 23 to 29 May – Deere shot down three Bf 109s and three Bf 110s and was decorated with the DFC by the King at a special ceremony at Hornchurch. During the Battle of Britain Deere destroyed seven more enemy fighters and one bomber and was awarded a Bar to the DFC. Deere took command of No 602 Squadron on 1st August 1941 and on that day destroyed a Bf 109, his first victory for eleven months. In February 1943 he was appointed Wing Leader at Biggin Hill. He flew 121 sorties during his six months’ leadership and increased his personal score to twenty-two confirmed victories, ten probables and eighteen damaged. Deere was awarded the DSO, the Croix de Guerre and the DFC (US). He was also awarded an OBE and retired from the RAF in December 1977, with the rank of Air Commodore passing away in 1995. 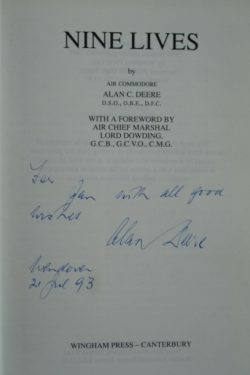 Deere wrote of his experiences and his many escapes from death in ‘Nine Lives’, which has come to be recognised as one of the finest personal records of the Battle of Britain. A great signed copy of this classic book, an essential volume for any aviation library.